Quick and edible cupcake toppers! 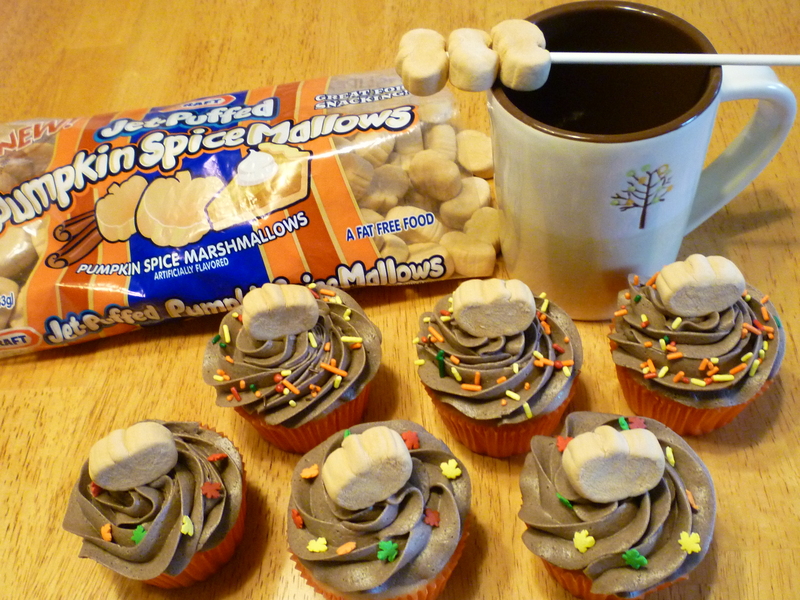 How about putting them on a stick and using them to stir hot cocoa? (oops, forgot the cocoa in the cup)! I want to try them on sweet potato casserole! Or make Rice Krispie Treats with them! 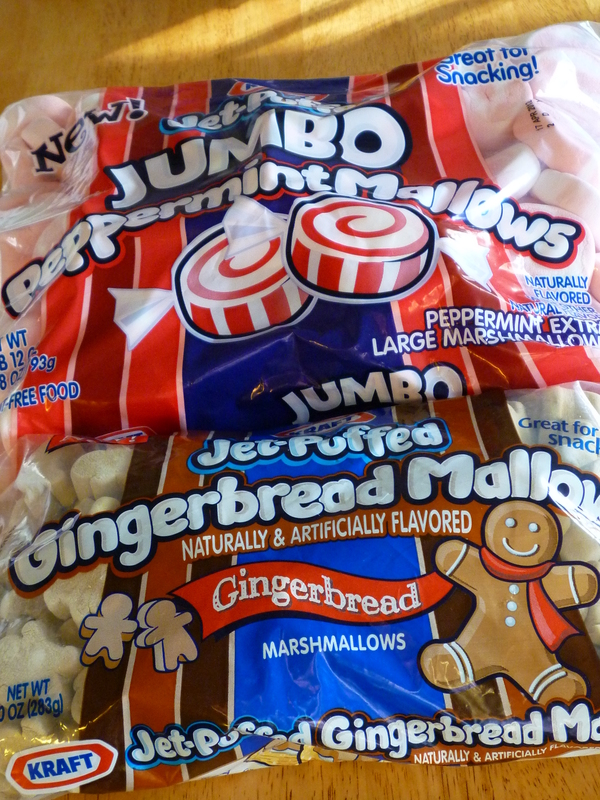 Peppermint Mallows came from Win-Co Foods … Gingerbread Mallows came from Wal-mart. 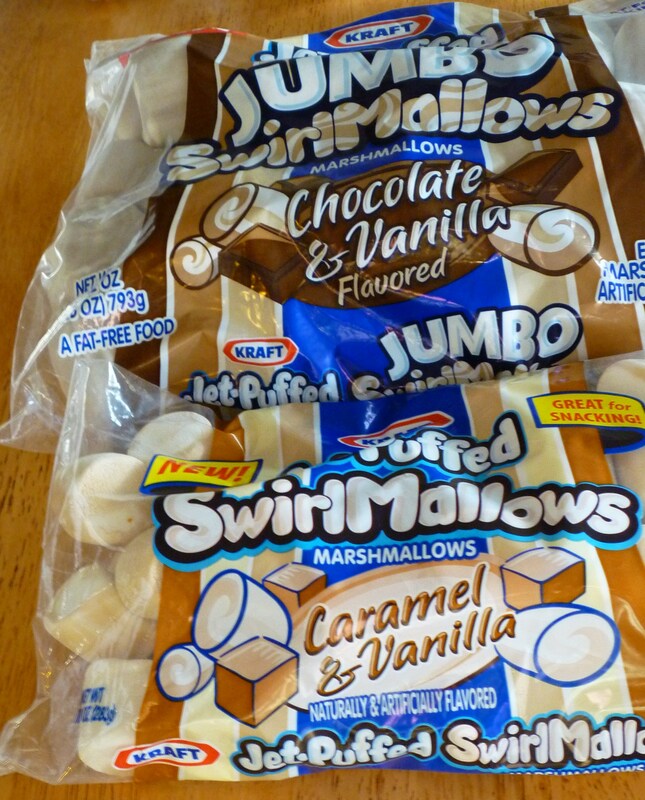 Jumbo SwirlMallows (chocolate & vanilla) came from Wal-mart … SwirlMallows (caramel & vanilla) came from Win-Co Foods. I plan on sharing my sources … I hope it helps you … and I’m sure there are other sources too. I have been reading all the entries and comments on the giveaway and it has helped trigger my memory too. I forgot that I bought two professional grade cake pans at the Goodwill for about $2.00 each, and they still had the price tag from a local cake decorating store for about $15.00 each. A few years ago, I was making my niece’s wedding cake in Johnson City, Tennessee … and didn’t bring enough supplies with me. I found a local party store that carried supplies … and I was very grateful. New York Cake West in West L.A. I have “Mint Chocolate Mallows” in the cupboard that I bought a few weeks ago. Any suggestions? The only thought that we have had is to put them in our cocoa. I think that will be pretty yummy. Cocoa does sound yummy. Are they jumbo or large? What color?